Anxious times call for steady leadership. When tensions emerge in a congregation, its leaders cannot be as anxious as the people they serve. To remain effective, congregational leaders must control their own uneasiness. This takes self-awareness and confidence to manage relationships and influence behaviors. Knowing how to deal with anxiety and how to work throug complex challenges can lead a congregation to new insights, growth, and vitality. 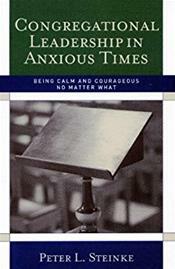 Anxious times hold not only the potential for loss but also for creation, important lernings, and changes that will strengthen the congregation. With this new book, internationally respected consultant Peter Steinke goes deeper into the requirements of effective congregational leadership. Born from the wisdom of Steinke's distinguished career, this new volume will both enlighten and embolden leaders. Steinke inspires courage in leaders to maintain the course, unearth secrets, resist sabotage, withstand fury, and overcome timidity or doubts. His insights, illustrations, and provocations will carry leaders through rough times, provide clarity during confusing times, and uplift them in joyous times.